72-year-old Catholic church in Regal closing after farewell Mass, held on Sunday. A farewell Mass was given to a packed church, attended by approximately 250 people, both current and former members, at St. Anthony Catholic Church in Regal on Sunday. It is not easy to close, said Bishop John Nienstedt of the New Ulm Diocese. There is disappointment and sadness in closing, but nothing on earth lasts forever, he added. "For all that has been, we say thanks," said Nienstedt, the celebrant of the farewell Mass. "Nothing can separate us from the love of God. Thanks for the blessing and faith at St. Anthony's." Father Fred Fink - who served St. Anthony from 1999 to 2005, before retiring, and a con-celebrant on Sunday - called it a bittersweet day. Celebrants at the final Mass at St. Anthony Catholic Church on Sunday were (front) Father Fred Fink, Father Jeff Horejsi, Bishop John Nienstedt, Father Bernard Schreiner, Father Merle Monnens, and Father Virgil Braun. In back are lector Betty Monson and mass servers Kayla Lieser, Tom Duscher, and Kelli Flannigan. Other con-celebrants at the final Mass were: Regal native Father Virgil Braun (who serves at Assumption Catholic Church in Eden Valley); Father Jeff Horejsi (who served the parish for its last month); Father Merle Monnens (who provided weekday Mass at St. Anthony); and Father Berndard Schreiner (who served the parish from 1951-54). St. Anthony Catholic Church was founded in 1933 with the first Mass in the Regal Community Hall. A basement church was built a year later. A cemetery was added in 1950. In 1952, the Regal Community Hall was moved onto the basement church. There are still nine members of the congregation who helped move the church: Margaret Bagley, Norbert and Ruth Braun, Stella Gruber, Leona Kotten, Virginia Keller, Lena Mueller, and Al and Rose Schaefer. Mary Heinen was the first person baptized in the new church in November 1953. St. Anthony was scheduled to become an oratory - still an official church with devotions such as rosaries and the distribution of Eucharist but without regular Sunday Mass - in 2008, according to a diocesan plan. With Fink's retirement this spring, the congregation was faced with the decision to become an oratory or to close much earlier. 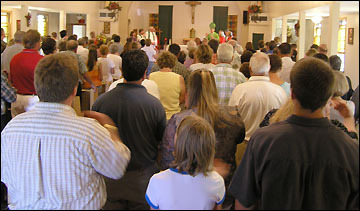 A packed house - approximately 250 people - attended the farewell Mass at St. Anthony Catholic Church in Regal on Saturday. The parish - comprised by 53 households (138 people), according to 2003-04 data - voted in March to close the church, after learning about Fink's pending retirement, rather than becoming an oratory. 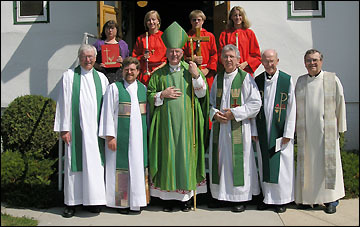 Four parishes have been identified by the diocese as likely for St. Anthony's current members to join: Our Lady of the Lakes in Spicer (with whom St. Anthony has split a priest since 1969); St. Louis Catholic in Paynesville; St. Margaret's Catholic Church in Lake Henry; and the Church of St. Francis de Sales in Belgrade. Church members who choose to attend church in Belgrade, Lake Henry, or Paynesville will be leaving the Diocese of New Ulm for the Diocese of St. Cloud. No decision has been made about the future of the church building. A memorial marker to honor the church, including a picture of it, will be placed in the parish cemetery, along with a bench to honor the two Weidner sisters from the parish who became nuns.